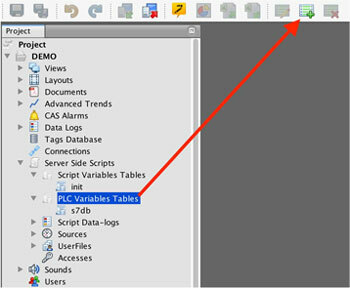 Variables Tables are used to read/write data from different data sources. This is a place where you can define all your global variables connected to the PLCs, databases, or to the memory variables. Once you define your variables in the corresponding tables, you can use them anywhere in the project as well as in server-side scripts. 1. Select a Script or PLC Variables Table from the Project / Server side scripts tree and click on New in the main toolbar. 2. Enter a new table name. As you can see, each table is associated just with one connection. 3. Fill in the variables and corresponding tags. As you can see, we are filling tags to read/write from the PLC. On the left side, we associate the variable with each tag.